A highly palatable, well balanced super premium food that has been developed in collaboration with veterinary Surgeons, dieticians, and ferret experts. The domesticated form of the European Polecat, ferrets are true carnivores, and in the wild would eat mice, birds, baby rabbits etc. Care+ is an extruded food derived from cooking meat,eggs and fish together to create a protein-rich feed. 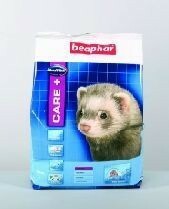 It has low fat content and contains Omega 6 and Omega 3 fatty acids, plus many other specific vitamins and minerals to keep your ferret in optimum health.